Tonight: Mostly clear, low in the 10s and 20s. 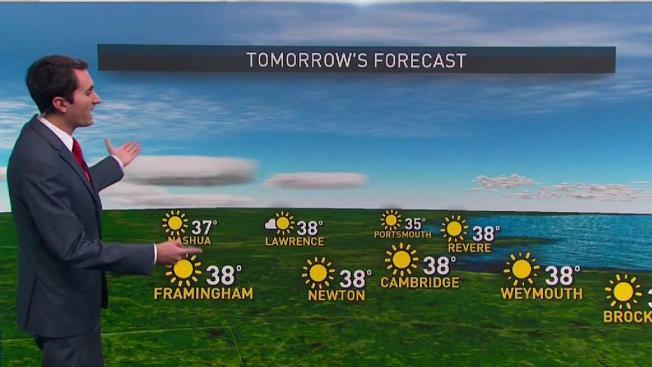 Wednesday: Mostly sunny, high in the 30s. Thursday: Sun to clouds, high in the 30s. A stalled out front – the collision zone between two types of air – sits over Central New England, holding truly cold air across the North Country while chilly but more moderate air remains in place to the south. Sometimes, clashes of air can light up as storm breeding grounds, but with an abundance of dry air in the Northeast, no such storms are expected. Instead, sunshine rules the roost with fair weather clouds occasionally dancing across our winter sky, eventually yielding only a few late day flurries to the North Country on Wednesday afternoon and evening. Well to our west, a new storm developing Thursday will slow travel through places like Chicago with rain and wind, and Minneapolis with snow…and that storm will move east to arrive here in New England Thursday night through Friday. With cold air ahead of the storm, it’s likely that much of New England will find at least a quick burst of wintry mix Thursday night, but warmth streaming ahead of the storm on a strengthening southerly wind will mean a fairly quick change to rain Friday morning for most, with accumulating snow to a mix in Northern New England, eventually likely to change to rain Friday, as well. Rain ships out Friday night and Saturday a northwest wind will renew snow showers in Northern mountains while the rest of New England finds mild air early Saturday, then new cool air breezes in Saturday afternoon and leaves behind a chilly Sunday. Several disturbances will ripple through the sky over New England Sunday onward next week, and this means an increased chance for snow or snow showers with cold air holding on, and while it’s early in such a pattern to be confident on timing of snow chances, you’ll find the chances elevated on all days but Monday in our exclusive Early Warning Weather 10-day forecast.